We are about to wrap up the last of our student capstone programs for Illinois Humanities’ inaugural course in Facilitation, Organizing, and Moderation (FOAM). 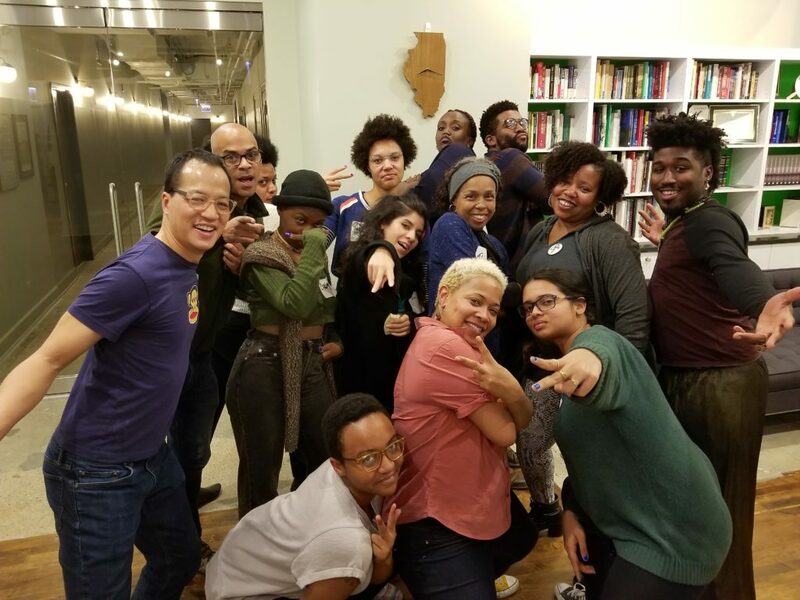 A cohort of 12 artists of color who spanned medium, age, background, and race/ethnicity came together for a five-week course where they learned strategies and how to structure, plan, and prepare for group dialogue, how to be responsive facilitators, organizers, and moderators, and how to deal with challenges as they arise. Each week featured a different guest instructor with diverse areas of expertise, including members of the Covey Group, Coya Paz of Free Street Theater and DePaul University, and Kamilah Rashied from the Art Institute of Chicago. Each student then planned and executed their own program, as a capstone project – convening an event where they acted in the role of facilitator or moderator, and put their newly-acquired FOAM skills to practice. The very process of being in community with each other for the five-week course felt powerful and productive, as we got to discuss the possibilities and challenges of being PoC space-makers and facilitators. We found solidarity in discussions about bringing our personal and artistic identities to our practice, and we shared our dreams of cultivating dialogue and action in our communities. These dreams were realized in each student’s capstone project, as they brought together the communities that mattered to them for events that spanned from round table discussions about parenting, to a conversation with historian Timuel Black and other alumni of DuSable High School, to a workshop for teaching artists on ethical practices, and many other similarly exciting conversations. With threats of diminished federal arts funding and antagonism towards marginalized communities looming large, it is now more critical than ever to engage in deep and creative dialogue about our world. Artists, and especially artists of color, are especially well-positioned to galvanize these conversations, powered by their practice and resilience in rendering an ever-shifting and changing world. My hope is that the FOAM community now feels more empowered to do this work, with each other’s support.